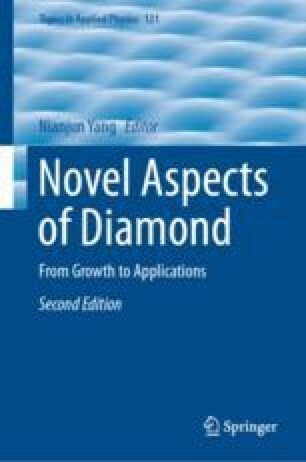 The unique physicochemical properties of diamond nanowires, such as negative electron affinity, chemical inertness, high Young’s modulus, the highest hardness and room-temperature thermal conductivity, etc., have generated wide interest for their use as fillers in nanocomposites, as light detectors and emitters, as substrates for nanoelectronic devices, as tips for scanning probe microscopy as well as for sensing applications. Although theoretical comparisons with carbon nanotubes have shown that diamond nanowires are energetically and mechanically viable structures, reproducibly synthesizing the crystalline diamond nanowires has remained challenging, due to its high hardness and chemical inertness. However, many efforts have been made to realize various structures of DNWs both theoretically and experimentally. Ab initio modeling of DNW structures including dodecahedral, cubic and cylindrical shapes were theoretically studied. The density functional theory (DFT) study of the surface structure of diamond nanowires with different morphology and cross-sections were also carried out. A number of experimental results have also been reported in fabrication of DNWs with different shapes. In this chapter, we present a comprehensive, up-to-date review for the diamond nanowires, wherein we will give a discussing for their synthesis along with their structures, properties and applications both from theoretical simulation and experiments. The authors appreciate the supports of the International Science & Technology Cooperation Program of China (no. 2013DFG50150), the Natural Foundation of Sciences of the People’s Republic of China (Grant no. 21,175,144, and 20,903,111) and the Key Project of Beijing Natural Science Foundation (Grant No. 2,120,002).